This lesson will guide you through the process of using Illuminate's proctoring tools for online assessments. The newly updated tool is called the Assessment Panel. You can monitor student progress, allow students to prompt you for help, and pause their assessment. It is helpful to open the proctor screen on a device you are using to monitor the administration. For each roster created, Student Info/Tools on the far right-hand side gives you access to different views. There are three types of proctoring, or views, available: Assessment Panel, Student(s) or General, or Aggregate. Today you are going to be learning about Assessment Panel. Note: The Pacing Mode, Pause Assessment, and Force Finish Assessment options only appear for the roster creator. Example: If a district roster is set up, teachers cannot pace, pause, or force finish the assessment for the entire district. Set Pacing Mode- This locks the current question for students. They only see the question you selected on their screen and they cannot move forward or backwards within the assessment. Note: Pacing Mode is only available for Itembank assessments at this time. Set Reveal Mode- If enabled, you will see color coded (correct/incorrect) boxes on screen. If disabled, only grey checkboxes will display. Set Answer Hide Mode- This allows you to see color coded (correct/incorrect) boxes on screen, but with no answer choice displayed within them. Enable Student Help Mode- This allows students to message you when assistance is needed during administration. Pause locks the student assessment screen for a quick break as needed. Force finish ends the assessment immediately. Switch Administration allows you to switch to a different online testing administration for the same test without leaving the assessment panel. List All Administrations will take you back to the list of all administrations. View a Student List for this administration. View Aggregate View displays by question, student progress, % correct, # correct, # incorrect, and a breakdown of responses. Access help documents by selecting Read Help Docs. 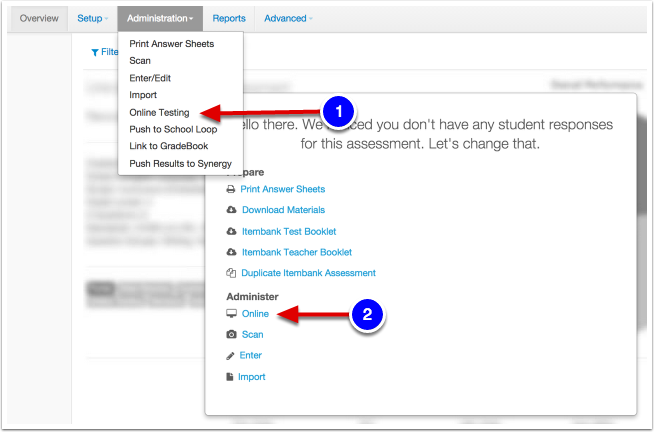 When enabled, this feature provides a student the ability to ask for assistance when taking an assessment. During the assessment, the student can select the question mark icon on their portal account, sending the teacher an alert similar to an instant message. The student receives confirmation that the message was sent and can continue working. 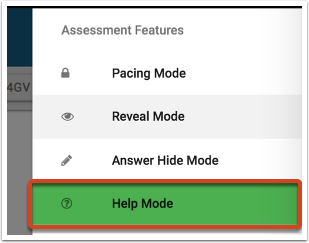 In the Assessment's Roster, select Help Mode to enable student help. Help Mode will turn green and stay that way. To remove or disable, select Help Mode again. The green bar will disappear and help will be disabled. On the assessment's Online Roster, a Student Help Request will display via the hand button. A pop up box will appear with any help requests. Teachers can either Acknowledge a single student or Acknowledge All, if multiple students are asking for help. 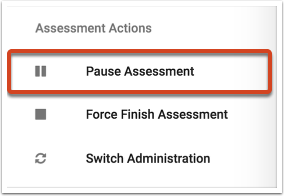 When enabled, this feature will Pause Assessment (accessed via the list button in the upper right hand corner of the screen) and freeze all students assessments from being changed. Pauses are meant to be short-term breaks when you need to get the class's attention, take a short break, stand-up and stretch, etc. If you pause and students exit the portal without submitting results or completing the assessment, the timer will continue to track how long the student has been testing. Student work is saved during each testing session and is available anytime within the testing window until they choose to finish and submit their answers. The administrator will then need to Resume Assessment for all students, or individual students in the Actions menu (list button in the upper right hand corner of the screen). Note, resuming the assessment will stop the timer, making the time elapsed data more valid. Students can still leave the assessment without submitting or finishing and can return to complete the test at any time within the testing window. When selected, a teacher can choose their proctoring view preference or select List All Administrations to return to the Assessment Roster Overview page. If using randomized answer choices for your assessment, live proctoring will not display as expected. It is best advised to use proctoring views such as Aggregate View and General Proctoring when applying randomized answer choices for administration. The Dashboard view allows you to view all students in an online testing roster at once. 1. Student Names (or your selected Sort Option) are listed on the left side of the screen. You can click on their name to see a pop up with all of the individual student's answers. 2. Click the dots next to a student's name to Enable Text to Speech, Reset their Password or Re-Open the exam. 3. Questions or Items are listed along the top with the correct answer in green. You can click on the magnifying glass next to the question number to view the Question. 4. If the student answered the question correctly, the corresponding box turns green. If they answered incorrectly, the box turns red with their incorrect answer choice in it. 5. 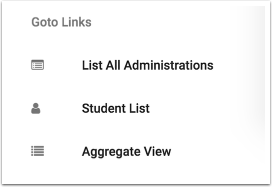 Sort By Options- This allows you to sort the selected view by Last Name, First Name, Student ID, or Anonymous. 7. Use N (Not Started), S (Started), P (Paused) or F (Finished) to sort which students are displayed. The Questions or Tile View displays item or question results in the form of tiles. 1. Select Questions to change from the Dashboard to By Item view. 2. Overall Response, Correct and Incorrect Percentage and Items as submitted live are displayed on the top of the screen. 3. Student Responses Box- This shows the student's correct response displayed green and student's incorrect response displayed red. 4. Zoom In/Out- You can zoom the display in to show more student responses on your screen (helpful for larger classes) or you can zoom out to show larger response boxes (helpful for displaying drawing response or graphing/math items). 6. Sort By Order- This sorts the selected option from ascending or descending, like A-Z or Z-A. 7. Use N (Not Started), S (Started), P (Paused) or F (Finished) to sort which students are displaying. 8. Tools such as Enable Help, Pause, and GoTo are available in all views. 9. The dots will provide a View Distribution view to see which students answered the item(s). Now that you have learned all about monitoring student testing, take a look at Grading Constructed Response Items from an Online Test to get started evaluating students' work!